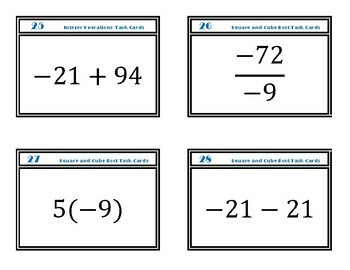 Use these mini task cards in many ways to mix things up in your classroom. I use the cards over and over in many ways throughout the year. Each time students get better. It is a way to practice and keep skills fresh. 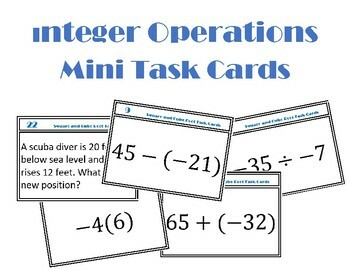 Look for my other mini task cards on TPT. 1. Simply use 1-3 cards a day as a warm-up. This can be preview, practice, review, or spiral review. 2. Play bingo. 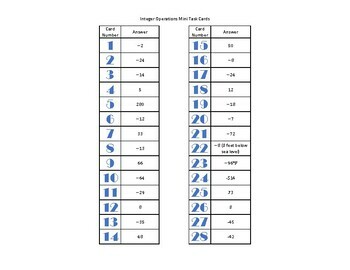 Show students the answers and have them place each answer in a box on a 5 x 5 grid. 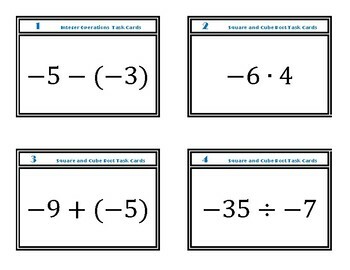 Show one card at a time and students can mark off the correct square. 5 in a row wins! 3. Stations - tape cards around the room and students complete each one as the find each card. 4. Rotations - Give each group 4-5 cards and a time limit (2-3 minutes). After the time is up, groups rotate cards and try the new ones with the same time limit. 5. Relay - put the cards in two stacks (one for each team). The teams line up on the opposite side of the room and take turns handing off an expo marker and running to the board. You stand at the board and give them the next card in their stack. When they are correct they erase the board and race the marker back to the next person on their team. The first team to finish all cards correctly wins.